On occasion of the IDS 2013, which will take place in Cologne between 12 and 16 March, DATRON is introducing two new products based on the proven DATRON D5 CAD/CAM system: the D5 Linear Scales, for maximum precision, and the D5 Entry, a starting level model to machine soft materials. restorations with the utmost precision. been specifically designed to machine soft materials such as zirconium oxide. machine metals in future, the D5 Entry can be easily expanded to the full version. everybody gets the best system for his own specific needs. 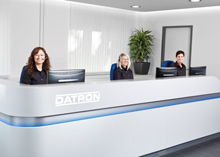 You will find DATRON at the IDS in Hall 3.1, Stand L008, M009.